The FX? 9003 head protector provides proper cheek weld for improved target aiming. 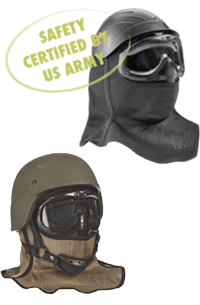 It can fit with most types of service helmet and is compatible with most Night Vision Goggles. It has optimal breathability and lens airflow as well as exceptional hearing and voice transmission capability. This head protector can be worn with most personal prescription corrective eye wear frames and accommodates ESS� and Revision� RX corrective vision inserts. It also comes with a removable modular hard top for users without service helmets. It is comfortable, lightweight, easy to clean and one-size fits-all. Available in black (8971960) or desert tan (8971962). Note that the head protector shown here in desert tan colour comes with a standard black removable hard top, the picture shows a military helmet, not included. Simunition? product no. 8971998 (black head protector) and 8971999 (desert tan head protector).